Tens of thousands of protesters took to the streets of Dublin on Saturday to demand the government drops its plan to introduce new water charges. Opponents say they can’t afford to pay and it is an austerity measure by the Irish government. The organizers of the rally, ‘Right2Water’ said around 80,000 attended the protest. However local police said the figure was nearer 20,000 to 30,000, according to the Irish Times. This was the fourth and largest mass protest since October, when the Irish government, which is seeking re-election next year, decided to start charging the public for the water they use. 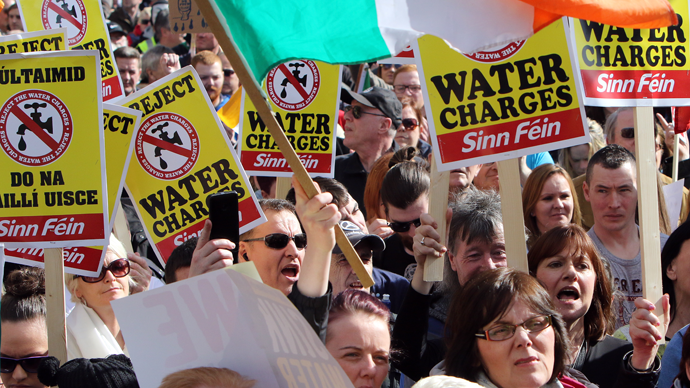 Irish politician Ruth Coppinger urged the protesters not to give in and pay the water charge. She believes that if people do not pay up, then the government will eventually be forced to drop the controversial charge. “Any future Government no matter who is in it...if the water charges are paid they will keep the water charges going. There are no penalties for non-payment for one whole year and three months...by which point there will be a new government,” she said, AFP reports. The first bills from the new Irish Water utility are due to be sent to households next month. The protests across the country have already forced the government to make some concessions including the abandonment of pay as you go meters. Dublin has introduced fixed rate meters, which charge water at 160 euros ($172) for single households and 260 euros for others. The water company says that around two thirds of those who are eligible to pay the charge have already registered with Irish Water. Approximately 1.5 million homes will receive water bills. "This government believes that the anti-water charges campaign is dying, that we are on our last legs. Well, today we have sent them a message," said Lynn Boylan, a member of the European Parliament for the opposition Sinn Fein party. "These families simply cannot take any more. The government is pushing people over the edge." The campaign, which has been organized by the pressure group Right2Water, argues the provision of adequately treated water and sanitation is a vital public service, and a fundamental human right recognized by the United Nations (UN). It is calling for the Irish government to legislate accordingly, and abolish its plans to enforce water charges on Irish citizens. “They thought they had gotten away with socializing €65bn of private debt, with a vicious five year austerity agenda. For five years those events caused nothing less than a national collective trauma. But now the Irish people have had enough and the government know it,” he added. The water charges were introduced by Ireland as the final part of the country’s austerity measures, which has seen the government, try to save €30 billion over a seven year period. Under the previous system, water bills were paid through general taxation and the services were operated by local authorities. Ireland was hit hard by the 2008 financial crisis; however the country is currently enjoying unprecedented economic growth. Its economy surged to a post crisis high of 4.8 percent in 2014 and it is again tipped to be the fast growing economy in the European Union this year.